If your partner is a Scorpio, it’s all about the intensity. Scorpio people are deep, moody and take everything to extremes, for better or worse. They need partners who can tolerate the downs as well as the ups. Scorpio could be your soulmate if you’re passionate and not afraid to plumb the depths. For Aries, there are few things worth digging their heels in about, as life is way too short for them to keep a grudge, unlike Scorpio who never forgets anything, ever! They each take responsibility for their own lives and have a healthy sense of keeping their individuality. They can also be very protective of each other, which will build a strong bond of caring and respect. Polar opposites in the fixed quality; the bull and scorpion embody many of the same energies, yet in opposite fashion. Deeply sensual, with strong desire natures, both are hard workers, stubborn and can have frightful tempers when crossed. Taurus seeks to create and sustain material security. The bull values serenity and they distrust complexity, resonating with the simplicity of the natural world. The Scorpio nature is intense; their complexity takes them into the deepest realms of the human experience. Where Taurus prefers stability and predictability, Scorpio requires transformational encounter. They are magnetically attracted and instinctively sense the complementary qualities of the other, but because both are so strong willed, the natural opposition of their natures can be hair-raising. They admire each other’s strengths and with supportive elements elsewhere in their charts, this union can work out well - with lots of understanding and patience - virtues that each have at their disposal. Taurus can help Scorpio to relax, offering emotional security and support, and Scorpio will surely appreciate sharing the luxurious environment that Taurus works hard to create! Scorpio can be fiercely loyal and supportive, which Taurus needs, and the scorpion helps Taurus move outside their comfort zone by bringing some greater tolerance for nuance to their understanding. They’ll enjoy exploring the worlds of nature and art, music being a likely common ground. Both are deep feeling and romantic, and sexually this combination can be extremely satisfying. These two can be on opposite sides and when it all goes bad, there can be no turning back. The potential for white hot passion and romance is there, but they also have the capacity to hurt each other to the point of no return. Of course, no relationship is impossible, but it will be hard work. There’s lots of interest and intrigue with these two, but the energy between them is full of mixed signals and missed connections. Scorpio is intense and laser focused - they don’t fool around. Gemini is laid back, needs variety and can be fickle in their attention as well as affection. With harmonious aspects elsewhere in their charts, a Gemini Scorpio connection can work, but it will be a challenge. If there’s a link, there needs to be a pact that Scorpio won’t dominate and Gemini won’t gossip – a tall order! Gemini can fascinate Scorpio with their keen intelligence, expressive talents and charm. The twins’ dual nature poses a puzzle that Scorpio may feel compelled to solve. Both signs are masters of disguise and both love a mystery, and chances are they’ll captivate each other – for a while. They may rarely connect on the level of their authentic selves, however, as their purposes and motivations are so different. Gemini seeks to experience all there is, to learn and taste all of life. A tenacious couple – both are powerful and passionate, with charisma and ambition to spare. If they can work together, it’s a dynamite match. Both signs are fixed in quality (translation: stubborn) and an inherent friction exists between them. But with supportive contacts elsewhere in their charts, this relationship can be enduring and fulfilling. Mutual respect is assured. Leo feels drawn to the emotional depth, sensitivity and intensity smoldering beneath the cool Scorpio exterior. Scorpio can fall easy prey to the aura of majesty surrounding Leo, and they’ll be captivated by the lion’s creative talent, charm and style. Leo lights up a room, their lion-hearted spirits spread sunshine that warms Scorpio to their core. Both have a dramatic, romantic nature and a committed relationship between these two will be fiercely loyal and devoted. Both have strong egos with a tendency to dominate, and power struggles can arise. Most of the tension between them will dissipate with a common goal, and as both are strong willed and ambitious, they can work extremely well together to create almost anything. Water sign Scorpio will feel a need to guard their quiet inner world of psychic and emotional sensitivity from time to time, as Leo’s fire burns hot and steady – too much fire can drain a water sign of life. Likewise, Scorpio’s emotionality and introspection can put a damper on the fiery Leo spirit, so the lion will feel a need to reboot their shine from time to time. Much depends upon compatible factors elsewhere between them. Power struggles of some sort are guaranteed with this combination, yet they can form an intensely powerful and loving union. If they bring a third element into the mix in the form of a creative intention that is dear to them both, this match can burn bright. Care must be taken, however, as fireworks from time to time are inevitable. A white hot emotional intensity connects these two. They mirror each other’s depth, mystery and powerfully passionate natures. These two will be both captivated as well as a little cautious in the early stages. Scorpio plays their hand close to the vest, and they may circle around each other with desire for some time before either opens up enough to initiate intimacy. Once that is achieved, however, they’ll experience profound joy at having found someone who can really match their depth of feeling and need for soul level encounter. Ambitious, strong willed and courageous, together, they can achieve anything they set their minds to. Even that which is thought to be impossible is within reach when two Scorpio’s partner up. They are very protective of each other and if one of them has been taken advantage of, there will be retribution in some form or another, either now or later. These two will sync up and soar together in exploring psychology and science, mysticism and spirituality as well as artistic, creative pursuits of all kinds. Being a fixed sign, Scorpio can be stubborn – and two Scorpios pitted against each other can turn into quite a contest. The intensity of this relationship is assured. The degree to which that plays out in gratifying or terrifying ways – or both – depends on their level of development and the number of harmonious factors elsewhere in their charts. These two will learn a lot about themselves in this relationship; it’s like looking into a mirror. Together they can reach ecstatic heights of passion. Also, they will usually agree on a common life purpose. This connection has a high vibration. If you’re going to try and make this union work, you better make sure there’s a lot of love and understanding, as well as a big capacity to forgive and forget. This is not a trait that comes easily to Scorpio. If they are willing, there are many lessons to be learned. Power Couple. When Scorpio and Capricorn walk through the door people take notice. These two have a lot in common and their energies blend to form a strong combination that can go the distance. Both take life, and most importantly, their work, seriously. Strong willed and ambitious, they both protect their sensitivity with a hard outer layer, and are essentially private people. They’ll appreciate the depth they perceive in the other, as neither has much interest in light-weight relationships, and communication between them is good. Both are masters of control and command respect. Scorpio experiences life primarily on an emotional level, while Capricorn approaches life more through the material world, and they can help balance each other with complementary strengths. Capricorn will soften and relax when they allow Scorpio’s deep emotional power and sensitivity to loosen their rigid control and reserve. Scorpio’s spiritual sensibility brings a light of faith into Capricorn’s world, and Capricorn can help ground Scorpio and channel some of their passion into practical avenues that yield tangible rewards. Because both are often so guarded, it may take some time before one of them makes the first move. Once they become intimate, however, the longer they’re together the better they get. It’s all a matter of understanding and respecting each other. Money management can be an issue with these two signs. Scorpio’s open to strategic speculation while Capricorn’s more conservative. It’s a good balance and if they can both relax a little they’ll prosper. Both are heavy-hitters with a lot in common. Their potential challenges are considerable, but they enhance each other and can create greatness together. This match can burn bright and long. Unpredictable - a wild ride. Getting to know each will be exciting and intriguing, but once a connection is established it can go either way. If the energy is right between them, they will get along like bees and a honey pot. Together, they can conquer anything and anyone. If they don’t connect, they are likely to be arch rivals and will instinctively know to tread carefully around each other. An inherent friction exists between Scorpio and Aquarius – both are fixed signs and can be very stubborn. Their essential natures don’t fully blend; watery Scorpio experiences live predominantly on an emotional level, while airy Aquarius functions primarily on the mental level of thought and intuition. They do have qualities in common, however, that can attract them into powerful friendships and, with supporting elements in their charts, intimate partnerships. They both march to a different drummer and are drawn to the strength of spirit they recognize in each other. They can both possess brilliant minds, and will rejoice in finding someone as sharp as they are! 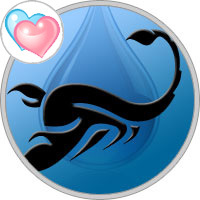 Passionate principles inspire them both, though Scorpio seeks more the inner world while Aquarius looks toward the future in a more abstract, intellectual way. They may find each other enigmatic yet fascinating, and the high energy that swirls around this intense duo can be intoxicating enough to make them want to overcome the challenges that exist in the relationship. Intrigue and curiosity brings them together, but once they have connected they’ll find that there are many areas of disparity. Scorpio is no-nonsense, and Aquarian has more than a few peculiarities. This pair can reach some stellar heights as creative partners, and with supportive placements in their charts, this electric match is worth the gamble.